These unique keychains are made from real cane toads. 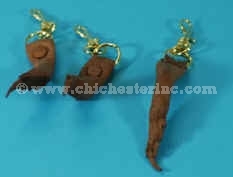 The Small Foot Charm measures 3.75" to 4.5" long, while the Large Foot Charm are 5.5" to 6.5" long. The Key Holder with Clip are 5" from the tip of the fingers to the end of the clip, with a head that measures 2" long by 1.5" wide. 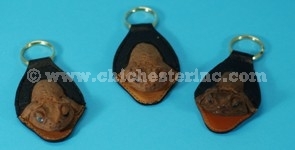 The key fobs come in two styles: Style A measures 4.5" long from end of clip to keyring. The leather part measures 2.25" long by 2" wide; and Style B measures 4.5" long from the nose to end of the keyring. The leather part measures 3.5" long by 2" wide. The leather is soft and supple. Genus and species: Bufo marinus. Wild. Cane toads are not endangered. A USFWS export permit is required for shipments outside of the United States.